Occasionally I get comments from Ashkenazic Jews from eastern Europe that they or certain members of their families have a few physical characteristics typical of East Asian peoples belonging to the Mongoloid race, such as something Asiatic about their eyes, cheekbones, or hair thickness. There are also some photographs of Ashkenazim where such features are faintly evident, although European and Middle Eastern (West Asian and Southwest Asian) phenotypes prevail in most families. On August 6, 2012, results from 230 Ashkenazic Jews who took the 1540C allele test were added to The ALlele FREquency Database's Graphical display of Allele Frequencies for Val370Ala - Locus Ectodysplasin A receptor by Kenneth Kay Kidd, Professor of Genetics at Yale University School of Medicine in New Haven, Connecticut. Of the Ashkenazim Kidd tested, 1.7% of them were found to have the 1540C allele, with the remaining 98.3% having the 1540T allele. By contrast, none of the 52 Sephardic Jews or 80 Yemenite Jews Kidd tested have the 1540C allele. Nor do any of the Samaritans, Bedouins, or Palestinian Arabs of the Israel-Palestine region have it. The Druze have a very small frequency of carrying it. Kuwaitis sometimes have it too, and Somalis for some reason have it in a significant frequency. The 1540C allele is most prevalent among East Asian peoples like the Japanese and Qiang. It's also common in Amerindians, who mostly descend from North/East Asians. One also finds it in Asian lands west of East Asia among part-Mongoloid peoples like Kazakhs, Hazaras, and Khantys. Among European peoples who possess quantities of 1540C are those with known East/North Asian ancestry including Chuvash, Finns, Hungarians, and Russians, but also Greeks and Adygei. It is not, however, found among most West European populations like French, Italians, Danes, Irish, British, and Sardinians. As a side note, Figure 1 in "Positive Selection in East Asians for an EDAR Allele that Enhances NF-kB Activation" by Jarosław Bryk, Emilie Hardouin, Irina Pugach, David Hughes, Rainer Strotmann, Mark Stoneking, and Sean Myles in PLoS ONE 3:5 (May 21, 2008): e2209 is consistent with Kidd's results in finding the EDAR allele 370A in a small number of Russians, and, likewise, looking at Figure 1 in Kamberov et al. 's study there is a barely-perceptible red sliver (designating the 370A variant) on the pie chart for the Northern Russians whom Kamberov's team tested. The more westerly European peoples tested by Kamberov's team entirely lack the allele. Want to know if you have the East Asian version of EDAR? If you've been autosomally tested by 23andMe, Family Tree DNA, or AncestryDNA, download your raw data, open the file, and look for the row marked "rs3827760". If you see AA or TT, you don't carry the East Asian version. If you see AG or CT, you inherited the East Asian version from only one of your parents, but still have an increased chance of having straighter and thicker hair and shovel-shaped incisors. If you see GG or CC, you inherited the East Asian version from both parents. Haplogroup evidence shows that several ancestral lines from East Asian women came into the Ashkenazic population hundreds of years ago through interracial relationships. The existence of such relationships before the 19th or 20th century wasn't documented; we only know they took place because of the genetic evidence. The mtDNA haplogroup M33c is found among Ashkenazim from Belarus as well as among South Chinese people "but from absolutely nowhere in between" those two regions, reports the genetic genealogist Ted Kandell here, here, and here, though he mistakenly called it M33c1. Kit 266609 - M33c - In a message dated July 2, 2013 Desireé Brown informed the "Ra1a1_Ashkenazi_Levite_Spreadsheet" group at YahooGroups.com that this kit belongs to her husband Stuart. Debra Winegarten is Ashkenazic and Family Tree DNA informed her that her haplogroup is M33c. Writing as "Devorah Winegarten", she told the "M33c DNA Cousins" group on Facebook: "My maternal line hails from Grodno, with stops along the way in Berlin, as well. Last names are Kagan, Cohen (in the US) and Lewin." Grodno is a city in Belarus also called Hrodna. She told me her most distant maternal ancestor was named Czerny Kagan. Shirley Saunders is Ashkenazic and Family Tree DNA assigned her father to the haplogroup M33c as she wrote here: "My late father Joseph Gann was Y R1a1a and MtDNA M33c. He came from northeastern Lithuania from the Rokiškis area." She told me Joseph's maternal grandmother Tzerilotte Gershon Shteiman "was born in the Dusetos area of eastern Lithuania near the Latvian border in 1842." Shirley's information is significant since it means M33c is also found in Lithuanian Jews; the study below by Jiao-Yang Tian did not report on its presence among Lithuanian Jews. An Ashkenazic person who was informed by 23andMe that his haplogroup is M33c told me his maternal line's ancestry comes from Polotsk, Belarus. Note that the kits listed above belong to M33c, not M33c1. Also note that none of the members (at this time) who were tested to belong to M33c and subsequently joined the "M mtDNA Haplogroup" project state their recent ancestry to be East Asian. M33c is a child of the haplogroup M, whose subhaplogroups are very common among peoples of East Asia and South Asia like Japanese, Ainu, Koreans, Vietnamese, Tibetans, Nepalese, Bangladeshis, Siberians, and Asian Indians. Subhaplogroups belonging to the clade haplogroup M33 are found among peoples of East Asia and South Asia. Specifically, haplogroup(s) of M33 were found in 1.8% of Southern Han Chinese ("CHS") people from the Hunan province of south-central China and the Fujian province of southeastern China in the study "Major Population Expansion of East Asians Began before Neolithic Time: Evidence of mtDNA Genomes" by Zheng Hong-Xiang, Yan S., Qin Zhen-Dong, Wang Yi, Tan Jing-Ze, et al. in PLoS ONE 6:10 (October 6, 2011): e25835 (see "Table 1. Haplogroup frequencies in the four East Asian populations") and among two Han Chinese who live in Southern California in the study "Mitochondrial DNA variant associated with Leber hereditary optic neuropathy and high-altitude Tibetans" by Ji Fuyun, Mark S. Sharpley, Olga Derbeneva, L. S. Alves, P. Qian, Y. Wang, D. Chalkia, M. Lvova, Xu J., Yao W., M. Simon, J. Platt, Xu S., A. Angelin, A. Davila, Huang T., Wang P. H., Chuang L. M., L. G. Moore, Qian G., and D. C. Wallace in Proceedings of the National Academic of Sciences of the United States of America (PNAS) 109:19 (May 8, 2012): pages 7391-7396. M33's child M33a is found among people in the Gujarat state of northwestern India per the study "In situ origin of deep rooting lineages of mitochondrial Macrohaplogroup 'M' in India" by Thangaraj, et al. in BMC Genomics 7:151 (2006) but that's a different branch from the M33c of Ashkenazim. M33c isn't the only M haplogroup that Ashkenazim possess. Some Ashkenazim who had the full sequence test performed on their mtDNA belong to the mtDNA haplogroup M1, especially its branches M1a and M1a1b. M1a1b came to Ashkenazim from the Middle East, Northeast Africa (Egypt), or the Mediterranean Sea region (Sardinia). An article focusing on M33c and its presence in both East Asian and East European Ashkenazic populations, but nowhere else in the world, has been published: "A genetic contribution from the Far East into Ashkenazi Jews via the ancient Silk Road" by Jiao-Yang Tian, Hua-Wei Wang, Yu-Chun Li, Wen Zhang, Yong-Gang Yao, Jits van Straten, Martin B. Richards, and Qing-Peng Kong in Scientific Reports vol. 5 (February 11, 2015): article number 8377. 34 members of the Han, Zhuang, Yao, Miao, Kam-Tai, and Tibetan ethnic groups of China, mostly living in southern China, were found to have M33c. It was also found in a few non-Chinese samples from Vietnam (2) and Thailand (1). You can see the entire list of the ethnicities and regional origins of their samples who belong to M33c here. Some of those samples came from Family Tree DNA. The 14 Ashkenazic maternal lines came from Belarus, Russia, western Ukraine, Poland, Romania, and Hungary. Since M33c's greatest genetic diversity is found in China, that is believed to be its point of origin. With regard to the Ashkenazic-specific branch of M33c, in the branching diagram it is closest to the branch belonging to the Han sample from Sichuan (coded SC* and DJY576 by the authors). You can see the branches on the median-joining network as well as the geographic map here and another branching diagram, the phylogenetic tree, is here. The founding lineage underpinning the Ashkenazic and Sichuan samples that distinguishes them from the other M33c samples by virtue of mutations is assigned the nomenclature M33c2 by the authors. The mtDNA haplogroup N9a3, which also originated in East Asia, is found among some Ashkenazim as well as among some East Siberians and some Sephardic Jews from Turkey, as Ted Kandell pointed out here. I got a few more details about N9a3 from email correspondence with William Boyce, who wrote about Ashkenazim having N9a3 here, and previously here and here (those two pages are now offline and not archived). Boyce told me: "[...] the n9a3 haplogroup found in about 1-2% of Ashkenazim [...] it is very rare, and found only sparsely, in regions stretching from Siberia to Kazackstan, Mongolia to South China. [...] Inside of the DIY 23andMe community, I've so far tracked down a dozen Ashkenazim (almost all with maternal Lithuanian roots), as well as 4 individuals of East Asian descent (2 South Korean, 1 Chinese, 1 Japanese), and one non-Ashkenazi European of maternal Romanian descent. N9a3 seems to have no more than a 2 to 3% presence in any given population, but is spread throughout a wide geographical area (including to my knowledge, Buryat, Siberian, Korean, Japanese, Chinese, Uzbek, Mongol and Altaic/Turkic peoples). I've also seen various data suggesting N9a3 is found in Hungarian, Czech and Southern Russian populations, but at incidence of no more than 1%." Later, in March 2015, Boyce observed: "I continue to find is that upwards of 90% percent of N9a3's through 23andme outside Ashkenazi's are of Korean descent." Boyce told me in March 2015 that he heard from a Turkish Jewish woman who belongs to N9a3 and says her maternal grandmother's mother came from the North Caucusus (presumably a Mountain Jew?). He was building a population map that shows Ashkenazic carriers of N9a3 whose ancestors lived in Lithuania (including Vištytis), Belarus (including Slutsk), Ukraine, and Russia. There's an N9a3 carrier in Qingdao, China of Chinese ethnicity. Lulu Q. Lin's family is from Shanghai, China "in recent generations" and she belongs to N9a3 as she commented on August 29, 2014 at 9:24pm. A staff member of the DNA laboratory Táiwān Jīyīn Sùyuán (Taiwan Gene Traceability) commented on August 2, 2015 at 5:14pm: "We also have someone tested N9a3. In Taiwan, 1.5% people have N9a3." In a message to Boyce's The N9a3 Project at Facebook, Boyce himself commented on October 6, 2013 at 9:04pm: "my maternal great grandmother was from Lithuania as well. From what I have seen so far- a majority of Ashkenazi Jews with N9a3 have maternal roots from Lithuania- including my own family." He was replying to Ava Rich who wrote on October 6, 2013 at 6:11pm that her Ashkenazic maternal great-grandmother was from Lithuania. But not every N9a3 carrier had their maternal roots in Lithuania. On February 10, 2014 at 2:41pm, David Tulchinsky wrote a comment to the Facebook page that his Ashkenazic maternal grandmother from whom he inherited N9a3 was originally from Ula, Belarus. On February 9, 2014 at 5:03pm Tulchinsky wrote that his second cousin Katrin Zanevsky shares the same ancestor in her maternal line so she also carries N9a3 and they have both tested through 23andMe. This discussion at forum.vgd.ru includes a July 3, 2013 uploading of a screenshot showing a list of some N9a3 matches in 23andMe including the Jewish member Kalman Davidov whose roots are from Lithuania, plus the aforementioned David Tulchinsky and some people without names listed publicly; the top of the list reveals it was obtained by an N9a3-carrying woman with eastern European roots including Ashkenazic family names and ancestors who lived in Vitebsk and Tomsk among other places. A misleading article titled "How Sara Sheridan's DNA test unveiled her past" appeared in the Scotsman newspaper on May 16, 2013. Sheridan's mother is a Russian Jew and she had her mtDNA tested by a company called ScotlandsDNA.com. The company's managing director, Alistair Moffat, claimed to Sheridan that her mtDNA originated around the island of Sakhalin in the north of Japan from the Ainu people. Moffat was right about her having an "incredibly rare" mtDNA haplogroup (not named by the article, and incorrectly called "9Na" by Sheridan's own article "Who Do You Think You Are?" in the Huffington Post on May 13, 2013, but it's N9a3) but wrong to try to pinpoint it as being solely "a Sakhalin marker" of Ainu origin. This claim by ScotlandsDNA led Sheridan astray and she was led to believe that in the middle of the 19th century an Ainu female slave had a relationship with one of her male ancestors somewhere in the Russian Empire. Whitehead added that an ancient population that inhabited modern-day Hungary sometime between about 10200 BCE to 2000 BCE also had carriers of this haplogroup: "In fact, a very recent academic paper from 2012 by Derenko et al from the Russian Academy of Sciences points to a series of Neolithic skeletons found in Hungary as being N9a3." Whitehead found "I have no less than four assigned third cousins on the DNA testing site 23andme, who are all N9a3, and they are all American Ashkenazi Jews from Poland/Lithuania/Belarus originally, who are related to me sometime back in about the late 18th/early 19th century." However, she's wrong to call N9a3 a specifically "Jewish subclade" as it is also found among non-Jews, as Kandell and Boyce noted further up. In a comment Whitehead submitted for online posting on a December 8, 2013 blog entry by Debbie Cruwys titled "Setting the record straight about Sara Sheridan's 'Japanese' DNA", Whitehead wrote, in part, "ScotlandsDNA advised the Scottish author Sara Sheridan that her N9a haplogroup was Japanese or Korean even though she was of Jewish Ashkenazi origins. Surely alarm bells should have rung?" No, I don't think so, because it's a fact (from the EDAR gene testing and autosomal testing that I cite on this page) that there's a little bit of East Asian ancestry in Ashkenazim, so finding a few haplogroups that reflect this ancestry isn't unexpected. Whitehead told Cruwys she researched Sheridan's family background using ScotlandsPeople.gov.uk, naturalization records hosted by the website of the National Archives, and JewishGen.org's Shtetl Finder and determined that Sheridan's maternal line ancestor lived specifically in the area that's today part of Belarus. I took a look at FamilyTreeDNA.com's N mtDNA project which allows anyone with a positive result for this haplogroup to join. Their description mentions that Ann Curry, of Japanese maternal descent, was found to belong to N9a by National Geographic's Genographic Project. Since both Ashkenazim and East Asians in their database carry N9a and N9a3, there is no basis for Whitehead's argument that N9a3 is some kind of specifically Ashkenazic branch. She preferred to see Ashkenazim as having inherited this haplogroup from a European-origin population like the Neolithics of Hungary because she was in disbelief about East Asian admixture into the Ashkenazic population. 23andMe reported to customers, including the Ashkenazic woman Sue Zemel whose haplogroup is N9a3, that "N9a is widespread in central and eastern Asia but extremely rare. Its only concentrations are among indigenous inhabitants of the Malay peninsula. The haplogroup is found at levels well below 10% from southern China to Mongolia and Kazakhstan." They list Malay, Semang, and Uzbek people as among the ethnic groups who have N9a, and their map shows that some people also have it in Japan and North Korea. The currently-unpublished study "Mitochondrial Genomes Uncover the Maternal History of the Pamir Populations" by M.-S. Peng, J.-J. Song, et al. includes 3 Pamiri mountaineers' samples uploaded to GenBank carrying mtDNA haplogroup N9a3: MF522908, MF522843, and MF522999. Pamiris live in Afghanistan, Tajikistan, and Pakistan. "A substantial prehistoric European ancestry amongst Ashkenazi maternal lineages" by Marta D. Costa, Joana B. Pereira, Maria Pala, Verónica Fernandes, Anna Olivieri, Alessandro Achilli, Ugo A. Perego, Sergei Rychkov, Oksana Naumova, Jiři Hatina, Scott R. Woodward, Ken Khong Eng, Vincent Macaulay, Martin Carr, Pedro Soares, Luísa Pereira, and Martin B. Richards in Nature Communications 4 (October 8, 2013): article number 2543 doesn't assign N9a to either a European or Near Eastern origin in "Supplementary Table S9. The source of Ashkenazi mtDNA lineages based on 836 control-region sequences". Costa's team's "Supplementary Figures" document indicates that they found Asian (non-West) mtDNA haplogroups in 1.1% of the Ashkenazim they sampled. They didn't name ALL of their exact haplogroup names, because they vaguely say that some of them belong to the categories or families "M/A" and list the rest in "Others". They include N9a as part of "Others". (The other "Others" they list are N1c and K1a4). The "M/A" group makes up 1% of the 1.1% so the remaining 0.1% is N9a. Since they say "Others" represents 0.5% of all Ashkenazic mtDNA lineages, N9a makes up only one-fifth of that. I assume that their "M/A" includes the above-mentioned haplogroup M33c combined with the haplogroup A that I write about below. The "M/A" Asian group is found in 0.5% of Czech/Austrian/Hungarian Jews, and 1% of West European Jews as a whole, but 2% among French Jews (! ), actually higher than the 1.4% reported among Russian/Belarusian Jews, and the 1.2% in Polish Jews. However, Romanian/Moldovan Jews also have 2% of these "M/A" elements. Their "Others" category that includes N9a is found in 1.4% of Belarusian Jews and 2% of Romanian/Moldovan Jews, compared with just 0.5% in Czech/Austrian/Hungarian Jews and absolutely zero percent in Jews from Poland, Ukraine, and the Baltic region. Although their particular Baltic Jewish samples lacked N9a, known holders of N9a in other databases do include Lithuanian Jews, as noted above by people who have N9a and looked at their matches. 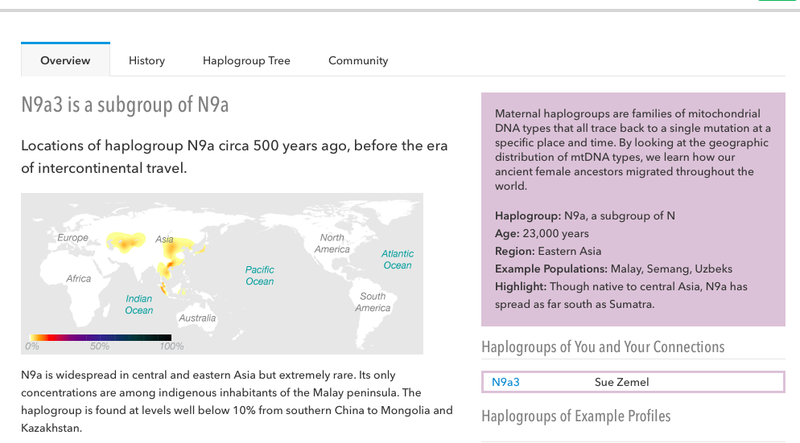 The mtDNA haplogroup A also is assigned an origin in East Asia. It is only rarely found among Ashkenazim. In the "Supplementary Data" spreadsheet of the study "MtDNA evidence for a genetic bottleneck in the early history of the Ashkenazi Jewish population" by Doron M. Behar, Michael F. Hammer, Daniel Garrigan, Richard Villems, Batsheva Bonne-Tamir, Martin Richards, David Gurwitz, Dror Rosengarten, Matthew Kaplan, Sergio Della Pergola, Lluís Quintana-Murci, and Karl Skorecki in European Journal of Human Genetics 12:5 (May 2004): pages 355-364, the authors indicate that the Asian mtDNA haplogroup A is found in 0.2% of the Ashkenazim they tested. That 0.2% represents a solitary individual in their study. Haplogroup A has the most carriers in East Asia as well as its greatest degree of variety there so that is believed to be its point of origin. East Asians with varieties of A include Koreans, Tibetans, Vietnamese, Japanese, Ryukyuans, Han Chinese, Nakhi of China, Yi, Hmong, and several others. Varieties of A are also found in Siberians (Evenks, Buryats, Mansi, etc. ), Mongols, Volga Tatars, Anatolian Turks, eastern Persians, Tajiks, Amerindians, and Inuit among others. The subclade of A that a few Ashkenazim belong to used to be called A4 as of Family Tree DNA's mtDNA Build 16, but in Family Tree DNA's mtDNA Build 17 released on March 24, 2017 it's called A-T152C!-T16189C!. Leslie Dann Weinberg and Fern Abrams wrote here that they are East European Ashkenazic Jews who belong to haplogroup A4 (reported by Family Tree DNA). Katerina Fomicheva wrote here that she's from Saint Petersburg, Russia and her Jewish mother gave her A4 (reported by 23andMe). Roberta Estes wrote here that some varieties of A4 are found among Chinese and Amerindians. The Amerindian branches, however, differ from the Ashkenazic branch, and the haplogroup A ancestor of Ashkenazim lived in Eurasia, not in the Americas. 18 out of 21 Ashkenazic samples tested in laboratories for use in the "HapMap 3, HGDP-CEPH, and Behar et al. (2010) datasets" discussed here and graphed here carry detectable amounts of "East Eurasian" ancestry (shown on the graph in red), usually around 1% or 2%, with the highest amount (3%) detected in sample number 433. The presence of this component is also true of the Ashkenazic sample submitted to the "Genomes Unzipped" project by Dan Vorhaus, who is coded as "DBV001" on the graph here. The genetic testing company 23andMe has tested the DNA of many Ashkenazim and reported back that they have a small amount of East Asian ancestry. This used to include what were purported to be tiny fractions from the Turkic-speaking Yakut (Sakha) people of eastern Siberia or a people closely related to them, but William Boyce told me in March 2015 that 23andMe had updated their methodology or their reference samples and a result was that the formerly "Yakut" segments in Ashkenazim were usually reclassified as "Broadly East Asian". Two American personalities whose recent ancestors were all East European Ashkenazim and were genetically tested by 23andMe for the episode "Our People, Our Traditions" in season 2 of PBS's television series "Finding Your Roots" with Henry Louis Gates, Jr. were found to have 0.1% East Asian admixture: the attorney Alan Morton Dershowitz and the playwright Tony Kushner. Many of Dershowitz's recent ancestors lived in the western Galician region of the Austrian Empire in towns that are now part of Poland. At least some of Kushner's ancestors also lived in Poland. The architect Frank Gehry (Goldberg)'s recent ancestors were all East European Jews from the Russian Empire in cities that are now part of Poland and Belarus. On the episode "Visionaries" in season 3 of "Finding Your Roots", it was revealed by 23andMe that Frank has 0.1% East Asian admixture. Joseph M. Cohen, whose recent ancestors were Ashkenazim on both sides of his family, was found to have 0.1% East Asian admixture, as shown on his 23andMe results here. Neil Gaiman, a writer whose ancestors were all Jews with roots in Poland and eastern Europe, wrote here: "According to @23andMe, genetically I am 99.6% Ashkenazi, 0.3% unspecified European and 0.1% East Asian. I want to know the story of that .1%"
Rachel Cohen-Rottenberg, from a Jewish family, wrote here that 23andMe told her "I am 97.2% Ashkenazi and only 2.6% European, with .2% of my DNA being East Asian and/or Native American." Jason Greenberg, all of whose recent ancestors were Ashkenazim, hailing from Romania, Belarus, Poland, and the Austrian Empire, was surprised by 23andMe's speculative mode estimating he's 0.1% "East Asian" on top of his 96.3% Ashkenazi and other European population elements. Its standard and conservative modes don't propose any East Asian ancestry for him. "Arkady", an adoptee who discovered through genetic testing that all his recent ancestors were Ashkenazim, wrote here that 23andMe estimated he's 0.1% "Japanese" plus less than 0.1% "Broadly East Asian". Gary Niemen, an Ashkenazic Jew, wrote in GEDmatch's General Interest Items discussion subforum that he scores less than 0.1% "Korean" plus between 0.1% and 0.2% "Broadly East Asian" on top of his 94.6% Ashkenazi and other European and Middle Eastern population elements. Judd R. Rothstein, an Ashkenazic Jew whose ancestors lived in Ukraine (Odessa, Yalta, Uman), told me, "I had an autosomel DNA test done on my great uncle, [...] and it confirmed that he has East Asian ancestry [...] 23andme said that my uncle was related to the people of 'Yakut' [...] my uncle's percentage was .01 which on a conservative estimate which and .02 on standard--which is why it could not have been of recent origin." Deb Berger wrote this comment to the YouTube.com video "Republic of Sakha (Yakutia)" uploaded by ttkturan: "I just had my DNA test done and was found to have 99.4% Eastern European DNA, - 94.4% Ashkenazi, 4% other Eastern European and and .6% Asian with a bit less than .1% Yakut. Interesting!" I assume Deb tested through 23andMe as that has both Ashkenazi and Yakut reference populations and a category called "Eastern European". However: some non-Jewish European people such as some ethnic English and some people with mixed English/French/German/Swiss/and-or/Irish ancestry also show (or at least showed prior to 2015) small amounts of Yakut component at 23andMe, usually also just 0.01%. The supposed Yakut admixture is not exclusive to Ashkenazim by any means. Small amounts of admixed elements of ancestry back more than 5 or 6 generations (such as an Amerindian ancestor who married into a predominantly European family) are often not detectable using 23andMe's "Ancestry Painting" technique because the inheritance of DNA from a particular ancestor many generations ago is not guaranteed. The specific element they categorize as "Ashkenazi" is the concatenation of ancestral roots shared between Eastern Ashkenazim and Western Ashkenazim, that is Middle Eastern + Western/Southern European. "Eastern European" is an extra element admixed into Eastern Ashkenazim from peoples like Poles and Lithuanians. Jeffrey D. Wexler told me he tested both of his Ashkenazic parents' autosomal DNA through the genetic testing company Family Tree DNA. Then he used the autosomal DNA functions on GEDmatch and discovered that his mother (whose grandparents lived in Botosani, Romania and Grigoriopol, Moldova in the late 19th century) "has a Siberian admixture that is not insubstantial." 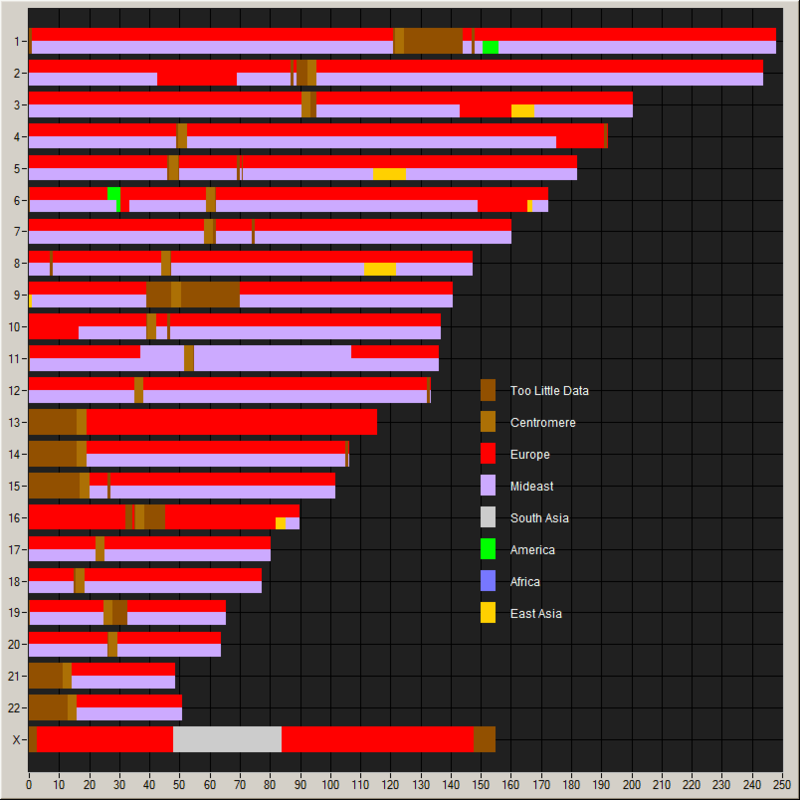 He used the Eurogenes Genetic Ancestry Project's Jtest utility which includes an Ashkenazi reference population. Jeff told me, "According to Jtest, my Mom has a Siberian admixture of 1.71%. [...] Koryak and Chukchi are identified as two of her secondary populations. By comparison, according to Jtest my Dad (JBW) is so Ashkenazi that he doesn't have any secondary populations on mixed mode population sharing. (All of his ancestors lived in Poland as of the early 19th century.) Nevertheless, Jtest shows that he has a Siberian admixture of 0.64%." Koryaks and Chukchis live in the Russian Far East. Although a similarity between his mother and those tribes was found, it doesn't mean his most recent purely or predominantly Mongoloid ancestor was a member of one of those tribes, because in comparisons of mixed mode population sharing "the software looks for two-population fits that could explain one's autosomal DNA make-up, but that your ancestors might not come from either of the populations", as Jeff explained. So his ancestor may have been some other kind of Siberian. Jeff wrote here that his ancestors also included Ashkenazim from Poland and Ukraine and there's a story in his family that one of his ancestors was a Sephardic Jew from Turkey, and Jeff stated that his personal Jtest estimates he's 1.04% Siberian. Cyndi Norwitz is "100% Ashkenazi" whose mother's roots lie in Slovakia and father's roots lie in Poland and Belarus. DNA companies report her Ashkenazic component to be between 94% and 100%. She wrote here that Jtest says she has 0.62% East Asian autosomal admixture but no Siberian admixture and that her EUtest results include 0.81% East Asian but again no Siberian admixture. She also got tested through 23andMe, which she told me reported "I've got 0.1% Yakut (and <0.1% nonspecific East Asian) on speculative. Both on my X. My brother and dad don't have it, so it came from my mom." "John Doe" a.k.a. Guy J. Jacks provided his Eurogenes results here. His Jtest results show 0.30% East Asian but no Siberian admixture. Similarly, his EUtest results show 0.35% East Asian but no Siberian. His Eurogenes K=15 results here contend that he's 0.62% Southeast Asian, lacking the Siberian element, and allegedly 0.29% Oceanian. His Eurogenes K=13 results here read 1.02% for East Asian. Keep in mind, however, that K=13's results for percentages under 2% are sometimes false readings; for example it gives some Ashkenazim false Amerindian scores. His ancestors were Ashkenazim who lived in Poland, the Galician region of western Ukraine, Germany, and the Posnen region of eastern Prussia. I saw the results of a person whose recent ancestry is entirely Ashkenazic with ancestors who lived in the 19th century in Galician Ukraine, Poland, Germany, Lithuania, and the Czech Republic. Their Jtest score for "EAST_ASIAN" is 1.16% (and their "ASHKENAZI" score is 28.55%), their EUtest score for "EAST_ASIAN" is 1.39%, and their Eurogenes K36 score for "South_Chinese" is 0.40%. A person scoring 27.41% "ASHKENAZI" has 2.51% "EAST_ASIAN" in Jtest (the highest I have seen so far for a full Ashkenazi), the Jtest oracle's mixed mode suggests they're 98% Ashkenazic plus 2% Chinese or 97.9% Ashkenazic plus Northern Han Chinese or Korean or Japanese, Eurogenes K=13 suggests they could be 3.20% East Asian, and Eurogenes K=36 suggests they're 1.46% Indo-Chinese (Indochina geographically includes southeast Asia) but gives them zero scores for "South_Chinese" and "East_Asian". A person scoring 27.69% "ASHKENAZI" whose known ancestors were all Ashkenazim in Ukraine and Poland has 2.08% "EAST_ASIAN" and 0.84% "SIBERIAN" in Jtest, the Jtest oracle's mixed mode suggests they could be 2.2% Japanese or Korean or 2% Northern Han Chinese or 1.9% Chinese or 2.9% Kazakh or 1.1% Chukchi or Koryak with the remainder Ashkenazic, and 23andMe suggests they're 0.3% Yakut. A person scoring 31.81% "ASHKENAZI" has 2% "EAST_ASIAN" and 0.52% "SIBERIAN" in Jtest, the Jtest oracle's mixed mode suggests they could be 1.2% Chinese or 1.3% Northern Han Chinese or Korean or Japanese or 0.1% Selkup or Chukchi or 0.2% Kazakh with the remainder Ashkenazic, and Eurogenes K=36 suggests they're 1.07% "South_Chinese" and 0.15% "East_Asian" but zero percent "Indo-Chinese". A person scoring 28.7% "ASHKENAZI" has 1.92% "EAST_ASIAN" in Jtest, the Jtest oracle's mixed mode suggests they could be 98.7% Ashkenazic plus 1.3% Chinese or Northern Han Chinese or Korean or Japanese, Eurogenes K=13 suggests they're 1.26% East Asian, and Eurogenes K=36 suggests they're 1.41% "Indo-Chinese" but gives them zero scores for "South_Chinese" and "East_Asian". A person scoring 29.23% "ASHKENAZI" has 1.39% "EAST_ASIAN" in Jtest, the Jtest oracle's mixed mode suggests they could be 99.3% Ashkenazic plus 0.7% Chinese or Northern Han Chinese or Korean or Japanese, and Eurogenes K=13 suggests they're 2.50% East Asian. A person scoring 28.31% "ASHKENAZI" has 1.66% "EAST_ASIAN" in Jtest and the Jtest oracle's mixed mode suggests they could be 98.8% Ashkenazic plus 1.2% Chinese or Northern Han Chinese. A person scoring 30.84% "ASHKENAZI" has 1.58% "EAST_ASIAN" in Jtest, and the Jtest oracle's mixed mode suggests they could be 99.3% Ashkenazic plus 0.7% Chinese or Northern Han Chinese or Korean or Japanese. A person scoring 29.73% "ASHKENAZI" has 1.27% "EAST_ASIAN" in Jtest, the Jtest oracle's mixed mode suggests they could be 99.5% Ashkenazic plus 0.5% Chinese or Northern Han Chinese or Korean or 99.6% Ashkenazic plus 0.4% Japanese, and Eurogenes K=36 suggests they're 0.34% "South_Chinese". A person scoring 28.48% "ASHKENAZI" has 1.25% "SIBERIAN" and 0.34% "EAST_ASIAN" in Jtest, and the Jtest oracle's mixed mode suggests they could be 99.2% Ashkenazic plus 0.8% Nganassan or 99.1% Ashkenazic plus 0.9% Chukchi or Koryak or 98.9% Ashkenazic plus 1.1% Selkup. A person scoring 27.64% "ASHKENAZI" has 2.31% "SIBERIAN" in Jtest, and the Jtest oracle's mixed mode suggests they could be 1.9% Nganassan or 2.1% Koryak or 2.1% Chukchi with the remainder Ashkenazic. A person scoring 27.34% "ASHKENAZI" has 1.97% "SIBERIAN" in Jtest, and the Jtest oracle's mixed mode suggests they could be 1.9% Koryak or 2% Chukchi or 1.6% Nganassan with the remainder Ashkenazic. A person scoring 31.55% "ASHKENAZI" has 1.54% "SIBERIAN" and 0.95% "EAST_ASIAN" in Jtest, and Eurogenes K=13 suggests they're 1.97% Siberian and 1.54% East Asian. A person scoring 27.17% "ASHKENAZI" has 1.52% "EAST_ASIAN" and 0.13% "SIBERIAN" in Jtest, the Jtest oracle's mixed mode suggests they could be 99.1% Ashkenazic plus 0.9% Chinese or Northern Han Chinese or Korean or Japanese, and Eurogenes K=13 suggests they're 1.76% East Asian. Many people of full Ashkenazic descent have zero "EAST_ASIAN" and "SIBERIAN" scores in Jtest. Seth Rogoff ordered an autosomal DNA test from Family Tree DNA. He then processed his raw data through the Eurogenes ANE (Ancient North Eurasian) K=7 test which calculated for him, as he posted here, that he has 1.90% "East_Eurasian" ancestry. His Jtest estimates are 0.80% East Asian and 0.81% Siberian as he posted here. His recent ancestors were Ashkenazim from Ukraine (including the Galician region), Poland, and Lithuania and his "Ashkenazi Diaspora" ethnic component level in Family Tree DNA's myOrigins screen is 100%. "John Doe" a.k.a. Guy J. Jacks, another Ashkenazi (whom I also discuss further up this page), was told by the Eurogenes ANE K=7 test that he's 0.31% East Eurasian, as he wrote in a comment here. P. F., another person who knows his recent ancestors were Ashkenazi, and whose Ashkenazi ethnic component level in 23andMe is about 95% on standard view and about 99% on speculative view, was told by the Eurogenes ANE K=7 test that he's 4.08% East Eurasian, as he wrote in a comment here. However, the Eurogenes ANE K=7 test in its version housed at GEDmatch is known to be partly defective at least for wildly overestimating some people's ANE scores. Peter B. Golden told me he tested his autosomal DNA through National Geographic's Geno 2.0 and learned he has 2% of the "Northeast Asian" component (that includes the peoples of China, Japan, and Mongolia in their definition). Peter's recent ancestors and relatives were Ashkenazim who lived in Belarus and Russia proper. Geno's admixture detection technique traces a person's ancestry several thousand years back. That's much further back than 23andMe can trace. Likewise, Brian wrote here and here that his ancestors were mostly Ashkenazim from the Galician region of western Ukraine except for one Jewish family line from Germany and that Geno 2.0 informed him he's 2% "Northeast Asian". David, posting under the pseudonym "Phyllis Sharon", wrote here that all his recent ancestors were Ashkenazim and that Geno 2.0 told him he's 3% "Northeast Asian". Boyce told me that an Ashkenazi woman in his project who carries N9a3 is reported to be 2% "Northeast Asian" by Geno 2.0 and that her family's oral history claims her great-great-great-grandmother (the ancestor she inherits N9a3 from) came from Mongolia. Martin Davis' recent ancestors were all Ashkenazim. The New York Genome Center's DNA.LAND interpreted Martin to be 2% "Northeast Asian: Siberian", as he wrote inside GEDmatch's Native American discussion subforum. This category is derived from population samples from the Chukchi, Itelmen, Koryak, Chaplin, Naukan, and Sireniki peoples. "Targum", whose recent ancestors were all Ashkenazim, wrote here that he is estimated by WeGene.com according to their algorithm in place as of January 2017 to have 1.77% of his ancestry stemming from peoples of China, including 1.04% Uygur (northwestern China) + 0.57% Lahu (a people in Yunnan province in southwestern China, south of Sichuan province) + 0.14% Hmong-Mien. Ted Kandell's four grandparents were Ashkenazim from Ukraine, Belarus, and Romania. Professor Doug McDonald analyzed Ted's raw data and suggested that "East Asia" ancestry exists on portions of his chromosomes 3, 5, 6, 8, 9, and 16, as Ted showed us here. The trouble is McDonald also identified a few other segments as "America" in origin which can't be right but must instead refer to descent from Eurasian people who are related to Amerindians. Ted Kandell wrote here that "Ashkenazi Jews and South Chinese" sometimes share some "autosomal segments". However, I have never seen an autosomal segment shared between Ashkenazim and Chinese that properly triangulates in a cluster, and in any event these segments are small in size. SUMMARY: Genetic testing consistently shows 1-2% Northeast Asian and East Asian (not Central Asian) ancestry in Ashkenazic Jews from Eastern Europe. Probably not from Khazars. From what we know this eastern ancestry came from maternal Asian ancestors, not from the paternal Khazar ancestors one would expect to find if Khazar male converts including from the ranks of the royalty and nobility of Khazaria had been among the ancestors of Ashkenazim. The Khazar conversion involved both males and females yet there is no trace of Asiatic male lineages in Ashkenazim. (Did some Asiatic male(s) actually join the community but happened to have their paternal lines die out because at some point all the children passing on their genes were daughters rather than sons? It's not impossible.) Also, the Khazars had relationships with people in Central Asia, but no Central Asian elements exist in Ashkenazim. Also seemingly incompatible with the Khazar theory is the absence of Ashkenazic genetics in common with modern Mongolian people, since Bayazit Yunusbayev, et al. reported in their 2015 article "The Genetic Legacy of the Expansion of Turkic-Speaking Nomads Across Eurasia" that "western Turkic peoples sampled across West Eurasia shared an excess of long chromosomal tracts that are identical by descent (IBD) with populations from present-day South Siberia and Mongolia" and suggested that the first Turks did come from that area. The East Asian ancestors of Ashkenazim came from beyond the geographic fringes of all Turkic and Mongolian speakers both past and present. Probably not from Yakuts. The miniscule amount of supposedly Yakut ancestry that some Ashkenazim used to show in 23andMe has since been reassigned in their samples to show undifferentiated East Asian descent instead. There is no evidence of any kind that supports a connection with the Turkic-speaking Yakuts. Probably not from Kalmyks. Some Kalmyk (Oirat Mongolian) women converted to Judaism in Siberia in the 1810s-1820s and soon thereafter married Ashkenazi men, especially those living in the town of Kansk. They presumably had children with them who stayed in the Jewish communities of Siberia and may have descendants there today. This is too recent an episode, and too far from the Pale of Settlement, to explain the small but widely distributed East Asian ancestral traces in most Ashkenazi Jewish families from Belarus/Lithuania/Romania/etc. The genetic types of the East Asian elements in Ashkenazim don't closely match those of the Kalmyks anyway. Possibly not from Evenki. Some Evenki people in eastern Siberia descend from mixed Evenki-Ashkenazi marriages. Some Polish Jewish men had participated in the 1863 uprising in Warsaw against the Russian tsars and as punishment got exiled to Siberia. Some of these exiled Polish Jews married local Evenki women and they had children who still had descendants alive in Siberia as of the end of the 20th century and presumably still do. The descendants of the mixed marriage married other Evenkis. As in the case of the Kalmyk-Ashkenazi marriages, this event is far too recent and far too distant from the Pale of Settlement to explain any of the results we see from eastern Europe. It remains unknown whether there had been any case of an Evenki-Ashkenazi intermarriage prior to the 19th century, or whether the woman who introduced N9a3 to Ashkenazim was instead a member of some other tribe like Buryat or Nanai. Probably not from Israelites. Autosomal DNA population portraits at the K=12 level prepared by "Dienekes Pontikos" here include samples from 10 Iraqi Jewish individuals. It is well established that Iraqi Jews are substantially descended from the ancient Israelites and are related to other Jews in the world. Although half of the Iraqi Jews in this sample have small amounts of South Asian ancestry, none have any East Asian or Siberian ancestry. This suggests none of the ancient Israelites did either. This impression is strengthened by the total lack of Siberian ancestry in Iranian Jews, Georgian Jews, and Yemenite Jews in the K=20 admixture paintings in the study "Ancient human genomes suggest three ancestral populations for present-day Europeans" by Iosif Lazaridis et al. 2014 and the absence of the East Asian 1540C allele in Sephardic Jews, Yemenite Jews, and Samaritans. It doesn't seem relevant, then, to point out that some modern Lebanese and Syrian people also have a bit of Northeast Asian in them, or that some Kuwaitis possess 1540C. As Razib Khan pointed out, the presence of East Eurasian admixture in some Muslim Middle Easterners is not usually found in non-Muslims from the region and "is surely the impact of Islamic slavery, of Turks". Are Russian Jews Descended from the Khazars?